Open the Google map above, click on Beaumaris Marina Ltd.
”To” or “From” your location to ours. Take Hwy#400 North - past the city of Barrie to Hwy#11 North - Stay in the 2 left lanes to continue North (turns into Hwy#11 N). Follow Hwy#11 North past all Gravenhurst exits. 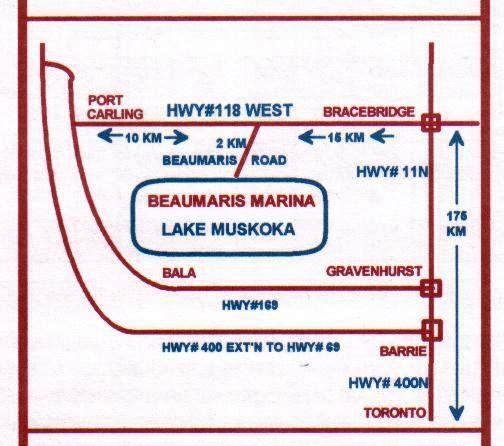 Take the first Bracebridge exit ramp - Hwy#118 West - turn left at the stop sign. Drive about 3km into Bracebridge - turn left at 'TIM HORTONS'. Continue on Hwy#118 West for 16km to Beaumaris Road. Turn left onto Beaumaris Road - go straight - 2km to the end of the road. © Copyright 2018 Beaumaris Marina Ltd. All rights reserved.